This is the festive season in which we celebrate the birth of Christ. Some, in our society, ask 'why do we celebrate the birth of Jesus?" St. John the Theologian answers this question as a glad tiding, "In the beginning was the Word, and the Word was with God, and the Word was God. He was in the beginning with God. All things were made through Him, and without Him nothing was made that was made... And the Word became flesh and dwelt among us, and we beheld His glory, the glory as of the only begotten of the Father, full of grace and truth" (John 1:1-3, 14). This account is highly regarded by the Orthodox Church. It is placed at the head of all the Gospel readings, by being the first Gospel reading of the Church's yearly cycle. It is also read in the Divine Liturgy during the Holy Pascha. The reading announces a revelation that the unutterable, unknowable, invisible and unattainable God Who, in the Second Person of the Holy Trinity, dwelt among us on earth. This revelation is also reiterated by St. Paul who said, "And without controversy great is the mystery of godliness. God was manifested in the flesh" (1 Tim 3: 16; also refer to Luke 1:35; Matt 3:17, 11:27, 16:16, 17:5; John 1:14, 1:18, 3:16; 1 John 5:20; Rom 8:32, 9:5; and Col 2:9). This 'good news' constitutes Christ's words, and the essence of the four Gospels and Apostolic writings. This is the foundation of Christianity, and the teaching of the Orthodox Church. 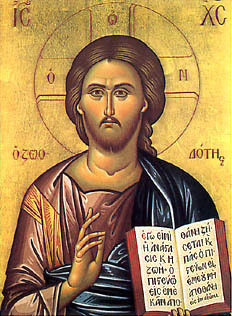 Faith in Jesus Christ as the Son of God is the reason why the Orthodox Church exists. The Evangelist John concludes the 'good news' in the main text of his Gospel, the last of the four Gospels, "... but these are written that you may believe that Jesus is the Christ, the Son of God, and that believing you may have life in His name" (John 20:31). The first Ecumenical Council of Nicea composed the Symbol of Faith (the Creed) to confirm the truth that "... in Him dwells all the fullness of the Godhead bodily" (Col. 2:9), thus proclaiming that Christ is God. Being perfect God, Christ the Saviour is at the same time also perfect Man, otherwise there is no hope or joy in Christ's Resurrection, because, as St. Cyril of Alexandria said, "If the nature which He received had not had a human mind, then the one who entered into battle with the devil was God Himself; and it was therefore God who gained the victory. But if God was victorious, then I, who did not participate in this victory at all, do not receive and benefit from it. Therefore I cannot rejoice over it, for I would then be boasting of someone else's trophies". St. Cyril of Jerusalem also said, "If the becoming man was a phantom, then salvation is a dream". Other holy Fathers expressed themselves similarly. The Church also proclaims that God is one in Essence and triple in Persons. In other words, God is Triunity, is Tri-hypostatical unity, is a Trinity One in Essence. The Hypostases have personal or hypostatic attributes. God is unbegotten; the Son is begotten from the Father; the Holy Spirit proceeds from the Father. We worship the Holy Trinity with a single and inseparable worship. We celebrate the birth of Jesus at Christmas time, Who is God Incarnate, because of the salvation His Resurrection offers us.